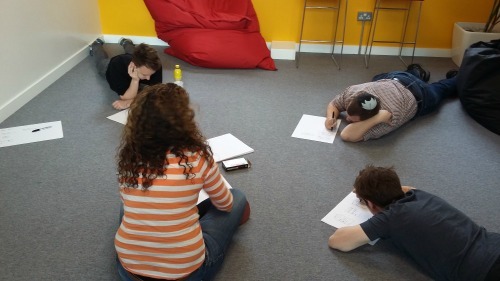 Recently people in my office have walked past one of our glass fronted meeting rooms to find a small group of us laying on the floor drawing (there is no table in this room). I know the first time we did this some people even came and took photos! So what were we doing? It is a method called Design Studio and we have been using it to start the design process off. We start by defining the problem we need to solve. 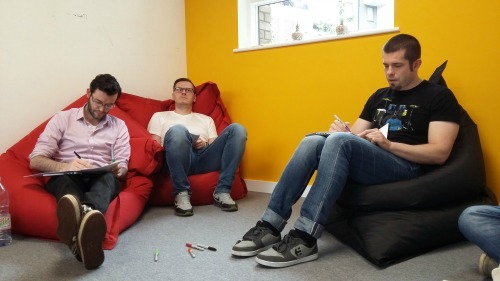 Then everyone has 4 minutes to sketch out as many ideas to solve the problem as they can. Everyone is then given time to explain their ideas, without interruption, and once we have been round the group the ideas can be discussed if needed. All the ideas are stuck up on the wall so everyone can see them, then we do it again. Except this time you can steal other peoples ideas if you want to, or maybe the discussion before might have sparked a new idea. Whatever new thoughts you have you then have another 4 minutes to sketch them out. Once again everyone is given time to explain their ideas and the group can discuss if they want. Finally we do a last session but this time working together to either come up with a rough idea of a design or to pull out the key things which came up in our sketching which we want to bring into the design. The best thing is that anyone can join a session because all we want are ideas. It does not matter if you can draw or not (everyone can draw) you just need to be able to communicate your ideas to the rest of the group. And you do not need to be part of the core team working on the problem to join in. Sometimes someone from a different team will have an idea which the core team might not have thought of, being as close to the problem as they are. I love this as a design method. It is a really good way to involve everyone across the company in the design process, and helps them to see what is involved in design. It is not always as simple as they think. It also helps people to have buy-in to the product or feature we are designing and it is a really unaggressive way to involve people. Everyone gets to have time to talk about their ideas and I am always careful to focus on the ideas and not the sketching skills. So if you receive an invite to join a Design Studio you should accept it. And who knows your idea might make it into the product your company makes.